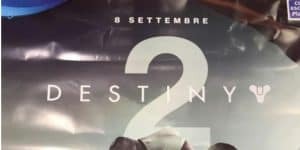 Rumor: Destiny 2 Poster Leaks Release Date | Nerd Much? Someone over in Europe took a picture of what looks like poster for Destiny 2. Surprisingly, the release date sounds like it will be coming fairly soon, on September 8. However, there isn’t a year on the poster, so that could be anything from this year to a few years from now. Game retailers around the world do so like to sell their pre-order copies before the game is even thinking about being out, so I imagine this poster is born from that. In addition, the poster also implies an early beta access for PS4 players, though that isn’t much of a surprise. Pictures of this poster come from Italian gaming website Lega, Imgur, and Twitter. All look like someone decided to snap a picture before throwing it in the trash. I would never have gotten away with wrinkling a poster from the Head Office that much, but maybe retail is run a little differently in Europe. After all, I do hear their cashiers have chairs at the till over there.